A lot of people think retirement is 'the big dream', the end goal, the culmination of one's experiences. 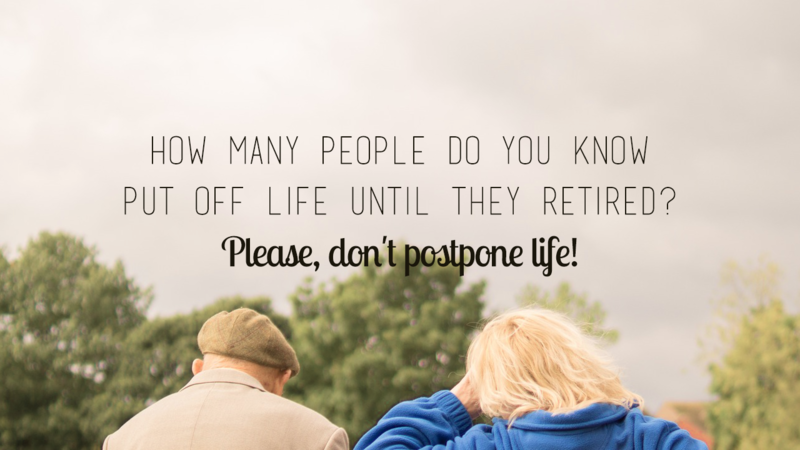 In reality, how many of you know people that have been miserable after a few months of retirement? Here’s the thing, you can only lay on the beach so much. You can only read so many books and play so much golf before you begin to get into a rut. Life loses meaning without passion and purpose. When I left my full-time position in 2013, it was amazing and wonderful - at first! Then I started to feel a little lost, a little bored. It was because I wasn’t wasn't contributing and using my skills to the best of my abilities. I didn't have a lot of passion when I used to live every day with passion in spades. I had to figure out how to do that again and with the discipline of one that works at a regular 9-5 job. How many people do you know that put off so many things in life- hobbies, travel, volunteer opportunities- until they retired? They postpone life. They go into retirement, thinking they're finally going to do the things they've put off their entire lives, only to end up some of the most unhappy people you know six months down the road. How sad is that? I will never retire and I don’t want you to either. Do not put off doing things on my bucket list until. How about instead we move from thing to thing discovering what we are good at, discovering what we enjoy, discovering our best talents and abilities? I know that I always want to be in a place of contribution, passion, purpose and striving to bring experiences and goals to fruition, whether for fun or for ‘work’. If you feel like you don't have anything you're passionate about right now, or that you don't really have a big purpose in life, I want you to go and strive for those two things - just start with some baby steps! Hate your job? Start working to figure out an exit strategy or create things outside of work that you enjoy so much, you can be a happier person in your work position as well. Once you find a place of passion and a place of purpose, you'll realize how much more you have to give and get out of life right now. I think most people want to retire because they want to have more freedom and control to do the things they want to do instead of the things they have to do. Start living that way NOW! Start learning how to make decisions and designing a life your enjoy. I know that sounds funny, but you have to learn to enjoy, how to be content, and how to make decisions that best benefit your future and your purpose. Will you quit doing parts of work you don't like at a certain age? Will you get to a point where you stop doing things you don't have to do? Will you eventually only have to do the things you do want to do? If that's your definition of retirement, I'm all for that! No matter what age you are - whether you're eighteen, thirty-five or seventy, it doesn't matter - work toward your place of passion and purpose. Find the time or opportunities to do more things in your life. Even if it's just a few hours a week, as long as it fills you with joy, go for it! If it gives you a place to contribute and fosters your sense of purpose, do it! Be passionate. Live your purpose. Because once you do, you'll never want to stop. You'll never want to quit. And you'll never want to retire.